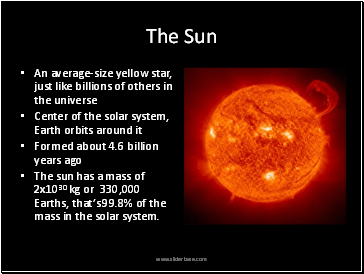 The sun has a mass of 2x1030 kg or 330,000 Earths, that’s 99.8% of the mass in the solar system. •The Sun is the source of all of the energy on Earth. •About half the energy that hits the Earth is absorbed and used to heat the planet. •You can feel this energy in the form of heat on your skin on a sunny day. 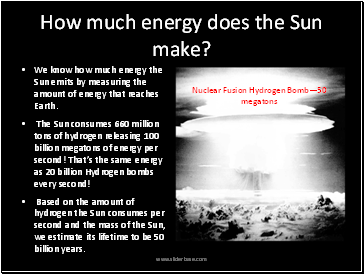 Energy is produced in the Sun’s core through a process known as nuclear fusion. Nuclear fusion is when nuclei of one kind of element combine to make a new nucleus in that requires less energy to hold it together. This difference in energy is spit out as a result of the reaction. 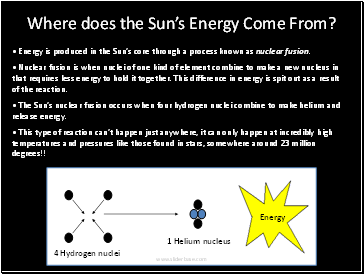 The Sun’s nuclear fusion occurs when four hydrogen nuclei combine to make helium and release energy. This type of reaction can’t happen just anywhere, it can only happen at incredibly high temperatures and pressures like those found in stars, somewhere around 23 million degrees!! How much energy does the Sun make? 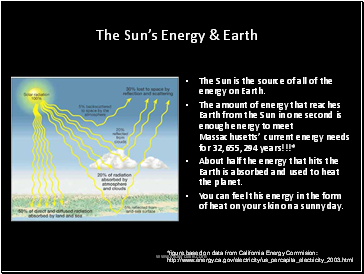 We know how much energy the Sun emits by measuring the amount of energy that reaches Earth. The Sun consumes 660 million tons of hydrogen releasing 100 billion megatons of energy per second! That’s the same energy as 20 billion Hydrogen bombs every second! Based on the amount of hydrogen the Sun consumes per second and the mass of the Sun, we estimate its lifetime to be 50 billion years. the core of the sun alone is the size of 13 Earths! 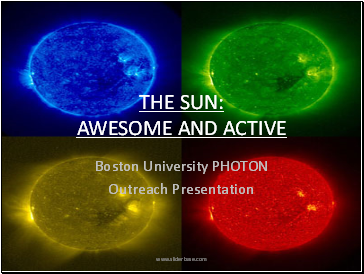 How is the Sun active? 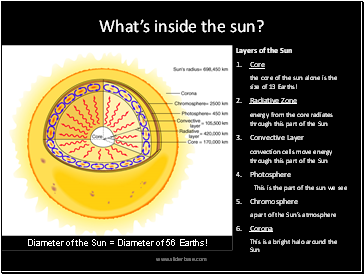 How do we know all of this about the Sun?